In this post, we are going to do a practical guided Tour of Service Workers, by focusing on one of its most important use cases: Application Download and Installation (including application versioning). As a learning exercise, I invite you to code along, and turn your application into a PWA by making it downloadable and installable! We will be doing the same to a sample application, available in this repository. If you have tried to learn Service Workers before, you might have noticed that many of the features of Service Workers and the Service Worker Lifecycle can, at first sight, seem a bit surprising. Why would we need a separate daemon instance to intercept the HTTP requests of our own application, where we can't really do long-running calculations or access the DOM? Are PWAs really taking off? Let's then start learning PWAs by example by doing an A to Z implementation of one of its key use cases: Application Download, Installation, and Application Version Management! We will do this from first principles using directly the browser APIs, and show what is going on in each step using the Chrome PWA Dev Tools. Note that we will build this Service Worker for learning purposes, as in production Service Workers are configured and automatically generated by build tools such as the Angular CLI or WorkBox. Let's then get started with our Service Worker Fundamentals deep dive! A Service Worker is like background daemon process that sits between our web application and the network, intercepting all HTTP requests made by the application. The Service Worker does not have access direct access to the DOM. Actually, the same Service Worker instance is shared across multiple tabs of the same application and can intercept the requests from all those tabs. Note that for security reasons the Service Worker cannot see requests made by other web applications running in the same browser, and only works over HTTPS (except on localhost, for development purposes). In summary: a Service Worker is a network proxy, running inside the browser itself! The code for the Service Worker is periodically downloaded from our website and there is a whole lifecycle management process in place. Its the browser that at any time will decide if the Service Worker should be running, this is so to spare resources, especially on mobile. So if we are not doing any HTTP requests for a while or not getting any notifications, it's possible that the browser will shut down the Service Worker. If we do trigger an HTTP request that should be handled by the Service Worker, the browser will activate it again, in case it was not yet running. So seeing the Service Worker stopped in the Dev Tools does not necessarily mean that something is broken. The Service Worker can intercept HTTP requests made by all the browser tabs that we have opened for a given domain and Url path (that path is called the Service Worker scope). On the other hand, it cannot access the DOM of any of those browser tabs, but it can access browser APIs such as for example the Cache Storage API. You might be thinking at this point, what does network proxying have to do with application download and installation, and offline support? The Service Worker is a network proxy with an installation lifecycle, but it's up to us to use it to implement native-like PWA capabilities: the Service Worker by itself does not provide those features. So let's see how can we design a solution based on the Service Worker that will implement the background download and install use case. And this is how having a network proxy in the browser allows us to have installable web applications! This is all 100% compatible with the back and refresh buttons. Let's then start implementing this design: first we need a sample application. When should a Service Worker be registered? Even if we detect that the browser does support Service Workers, we are still not going to register a SW immediately! In this case, we are waiting for the page load event. Why delay the registration of the Service Worker? There are a couple of reasons why we want to delay the registration of the Service Worker: we want to avoid causing disruption of the initial user experience, as the application loads for the first time. Browsers only do a limited amount of HTTP requests at the same time, and there is only so much network capacity. The Service Worker might or might not do separate network requests that can interfere with the ones needed to show initial content to the user. This means that delaying the Service Worker registration prevents the Service Worker from degrading the initial user experience. Instead, the Service Worker will wait for the application to start up and then it will be installed in the background. Note that in the case of a single page application, we might want to delay the registration even further, and wait beyond the load event. The key is to understand that in the case of a Service Worker that does download and installation, we want to register it as late as possible, to avoid degrading user experience. Another reason for delaying the registration of this type of Service Worker is to have consistent application behavior. Let's remember that the Service Worker will often serve the whole application itself! If some of the initial requests for a page came from the network, we want to make sure that all the remaining bundles were also loaded from the network as well, for consistency. In the case of application download and installation, we want to avoid falling in a situation where we activate a Service Worker in the middle of a page startup. This is because depending on timing conditions, we might accidentally fall into some hard to reproduce situation where the page is broken due to an unpredictable combination of HTML/CSS/JS artifacts, some coming from the network and the others from some sort of cache that the Service Worker is using. In the next time that we visit this page the Service Worker will be active, and then we will load all resources from the Service Worker, instead of the network. This means that again we will have a consistent set of bundles, all coming from a cache and corresponding to a given version of the application. What happens at registration time? In the example above, when the load event triggers we are going to call register() and identify the file sw.js as being a Service Worker script. The browser is then going to download the sw.js file, and version it by creating a snapshot of all the bytes contained in this file. In the future, even if one single digit changes, the browser will consider that there is a completely new version of the Service Worker. What is the service worker scope property? The scope property determines what set of HTTP requests can be intercepted by the Service Worker, or not. In this case, the scope is '/', meaning that our Service Worker will be able to intercept all HTTP requests made by this application. If the scope would instead be /api, then the Service worker would not be able to intercept a request like for example /bundles/app.css, but it would still be able to intercept a REST API request such as /api/courses. This means that its possible have multiple Service Workers running on the same page, but on different scopes! If a Service Worker would have a unique identifier, it would be the combination of the origin domain plus the scope path. And this how the browser determines if two different scripts correspond to two different versions of the same Service Worker (and not based on keeping the same SW sw.js file name). If two Service Worker scripts have the same scope path and even a byte of difference, the browser is going to consider them two versions of the same SW and install the latest version in the background. Can I place the Service Worker in any folder? The location of the sw.js file is important: if this file would be placed in a folder /service-worker/sw.js, then it would not be able to intercept requests like /bundles/app.css or /api/courses. Instead, the maximum scope of HTTP requests that the Service Worker could intercept, would be any requests starting with /service-worker, the folder where the script is on! Given this, we could, for example, register different service workers for different scopes: one service worker for all /bundles requests and another for all /api requests. As we can see, there is a ton of flexibility! Right now, for implementing Download and Installation, we are going to use the root / scope and use only one Service Worker. When the browser identifies a new version of the Service Worker for a given scope, it will trigger the install phase, which results in the emission of the install Lifecycle event. Note that the Service Worker spec does not define what happens exactly in the install phase. That is up to us to implement that, by listening to the install event in sw.js. This code is actually the implementation of a simple logging HTTP interceptor, and we will evolve it to implement Application Download & Installation! As we can see, like almost all PWA-related APIs, the Service Worker API for these lifecycle phases is Promise-based. During these phases, we can do asynchronous operations like for example fetch resources from the network. In order to mark a phase as completed, we return a Promise that when resolved will successfully mark the phase as completed. In this case, both the install and activate phases return a Promise that gets successfully resolved, and so the application is now ready to start intercepting network calls. Let's now have a closer look at the callback of the fetch event, which contains the HTTP logging functionality. As we can see, this fetch callback is going to return the actual response of the HTTP call using respondWith(), and the response can be calculated asynchronously by passing a Promise to respondWith(). This response passed to respondWith() is then going to be passed to the application! As we can see, this Service Worker acts as a logging proxy. From the point of view of the application, this response served by the Service Worker is indistinguishable from a call made if the Service Worker was not present, the only side effect is the logging in the console. This initial logging example is everything that we will need to understand in detail the Service Worker Lifecycle. Why isn't the Service Worker immediately active? You might have noticed one thing: although we are logging the installation and activation events, but there was no HTTP request logged to the console which means that fetch event does not seem to be working! It's like the fetch logging interceptor is not working, even though the Service Worker is active. So it looks like the Service Worker started intercepting HTTP requests only after we reloaded the page. That's a bit surprising the first time we see it, but this happens by default to ensure consistency. The Service worker behavior we see here, although surprising at first it's actually a great feature that is very well thought out. And this ensures consistency: one version of the page, one version of the service worker. This avoids a whole class of some very hard to troubleshoot error scenarios. How do Service workers interact with Browser tabs? Let's now simulate some normal user behavior. What happens if we open other browser tabs of the same application? We are going to see that this page is being served by the exact same SW Version 1! Note that the console logging is shared across tabs, which can be rather surprising. If you refresh the application a couple of times and then switch back to another tab you are going to see logged HTTP requests that were made in the other tab. This is actually expected, because we have the same Service Worker intercepting the requests from all tabs. To further understand the Service worker Lifecycle, let's now see what happens if we modify something in the Service Worker code. Let's, for example, modify the version number to v2. Notice that we don't need to change the name of the file sw.js to notify the browser that a new version of the Service worker is available. The browser will see that both versions are linked to the scope /, and if there is even one character of difference between both versions, the browser will install the new version. As we can see, the new version of the Service Worker is not immediately applied, it's in some sort of Waiting state! Version v2 was Installed in the background, but not Activated! Why is the new version v2 Installed but not Activated? One reason is that we have multiple tabs opened, and we want to show to the user a consistent experience. It would be confusing for the user to have two tabs opened running different versions of the same application. And because Service workers intercept and modify HTTP requests, two different versions of the service worker might mean two different versions of the application itself! So how will the browser handle this new version of the Service worker running on the / scope? The browser is going to go ahead and perform any Installation operations like download bundles or an offline page in the install phase of v2, but the browser will not Activate v2 as long as there are multiple tabs opened still running v1. This consistency by default is a key design goal of the Service Worker Lifecycle! Now, before continuing to explore the Lifecycle, a quick note about browser Hard Refresh and Service Workers. If something is unclear while trying out Service Workers, trying to do a hard refresh (Ctrl+Shift+R) will not help in the learning process. This is because if you hit hard-refresh, the whole Service Worker is going to be bypassed, and it won't control the page - This is the standard browser behavior which is unlikely to change. Ctrl+Shift+R is meant to bypass all network caches, and because the Service Worker is often used for caching, it bypasses it too. With this important note out of the way, let's continue to dig deeper into how the Service Workers Lifecycle works, and how it enables Application Download and Installation. Let's understand why at this stage with v2 already Installed why is v1 still running, and why v2 is not yet Active. Why even with only one tab opened the new SW version will not become active? We did refresh our single tab running v1, but still, v2 was not activated: v2 was Installed in the background, but not Activated. This is because, from the point of view of the browser, the current page remains active until the refresh completes, and only then the page gets swapped out when we have at least received the response headers from the server. And because the page was kept during part of the refresh process, the only way to ensure consistency is to keep it active all the way through the whole process. After that, because we have kept the Service worker v1 active during the refresh, we want by default to keep it running after the refresh completed as well, which explains why V1 is still active after the page refresh is completed. How to activate the new Service Worker version V2 then? One way would be to use the skipWaiting option in the DevTools, but let's not do that! Let's instead reproduce the normal user experience: let's close all tabs running service worker v1, and open a new tab. As we can see, this time the browser activated Service Worker v2 that it had previously installed in the background, and v2 intercepted all the network requests from this page, meaning V2 is now Active! And with this, we have now a good understanding of the Service Worker lifecycle so let's summarize. This last point is especially important for the Download & Installation Use Case that we are about to review. Where does the Service Worker store those files then? At installation time, the Service Worker is going to fetch from the network all the bundles that together make a given application version, and then it's going to store them in a browser cache know as Cache Storage. Like the Service Worker API, Cache Storage is also Promise-based and very easy to use. Let's then take this API and use it to implement the installation phase of the Download and Install use case. Let's then start adapting our Hello world logging interceptor example, and extend it with background Installation capabilities. This panel is available on the same Application tab in the Dev Tools, under the collapsible menu named Cache Storage. As we can see, all the application bundles have been downloaded in the background, and the application is ready to be served from the cache! But before doing so, let's go ahead and first clear all previous versions of the application from Cache Storage. The best moment to purge previous versions of the application is at Service Worker Activation time, because this is the only moment that we can be sure that the user is no longer using the previous application version in any of the browser tabs. As we can see, we are looping through all the cache names available in Cache Storage, and deleting all caches that don't correspond to the current application version (which is V3). Notice that caches.keys() is returning a Promise, like in general it happens with Cache Storage API calls. We want to wait for that Promise to resolve and then use that value in the rest of the code below, and so we are applying the await syntax that will wait for the Promise to resolve before continuing. As we can see, this is a great way to make asynchronous Promise-based code to look much more readable and closer to synchronous code, but this only works inside a method annotated with the async keyword. This async/await syntax is already available in a lot of browsers (see here for support), for example in Chrome you can try these examples without any transpilation needed. With this in place, any request that the application makes to load the cached bundles will be served from Cache Storage, while other requests such as for example a REST API call to /api/courses will still go through to the network. And with this last step in place, we have a complete solution for downloading and background installing our web application! So let's try this out. To see the Download and Install mechanism in action, let's open a new tab in our sample application, and see that it's now running version V3 of the Service Worker, which implements the Download and Install feature. Imagine that we did a ton of modifications to the application, like changing its design or applied a new theme. How is the user going to get that new version v4, if version v3 is still being served each time directly from the cache? As we can see, V3 of the Service Worker (and of the application) are still up and running, as expected. This means that the application version was served by Service Worker v3, which means the bundles all came from the Cache named app-cache-v3. As we can see, version V4 is waiting to be Activated. But the bundles of V4, which could correspond to a completely different version of the whole web application are now ready to be used. In order to activate version v4, let's simulate some normal user interaction. The user would eventually close all the browser tabs running version v3, and then come back later to the application. And with this, the whole lifecycle is completed and the user now has a freshly updated version of the application downloaded and installed in the browser. The new version of the application was donwloaded and installed in the background, without interfering with the normal user experience. This is actually even better then native mobile installations! What we have described so far was the default behavior of the Service Worker Lifecycle, which makes a lot of sense in the context of the Donwload and installation use case. Let's now see how can we customize the Lifecycle if needed, to better suit other PWA use cases. Notice that modifying the behavior of the Service Worker Lifecycle although tempting, is not really recommended, as we will see. In this example, we are awaiting for the files to be downloaded and installed, and then we are going to call self.skipWaiting(), which will return a Promise. This will cause the Waiting Phase of the Lifecycle to be skipped, and for the new version of the Service Worker to become immediately active. This means that if the user opens a new tab, the new version would be active which might lead to inter-tab inconsistencies. In most cases, it's better to not skip the Waiting phase and avoid those inconsistent scenarios by design. This does not mean, however, that by using skipWaiting() the new version of the Service Worker can immediately intercept requests from the running tab. We have seen that for example that the very first time that a page with a Service Worker is loaded, the Service Worker will be Installed and Activated, but it will somehow still not be able to intercept the network requests made by the page. We would have to refresh the page in order have the new Service Worker to start intercepting requests. Again, this is for consistency: if the initial requests of a page were not served by a Service Worker, then by default none of the HTTP requests made by that page after startup will be served by the Service Worker either. Calling claim() will allow the Activated Service Worker to immediately start intercepting requests (Ajax included) from the running page (as well as other open tabs), without having to wait for a reload. This early activation of the Service Worker brings the potential for an inconsistency: we might end up with a page served by version v4 to have its runtime HTTP requests intercepted by Service Worker v5. But for some use cases, this early activation is what we need: imagine a second service worker running on scope /api that caches application data on IndexedDB: we might want to activate it as soon as possible, to cache the application data as soon as possible. By default, the browser will check upon user navigation if there is a new version of the Service Worker on the server ready to be installed. If a new version of the Service worker is available on the server, the call to update() will trigger a new background installation. This periodic check is usually not necessary, as the browser will already do this check very frequently with each user navigation, or with other events such as for example if a Push notification is received. One good scenario when we would like to check if there is a new version is: what if the version that we are running has a bug? Let's then talk about what happens if something goes wrong with the application. As you might imagine, caching the application on the user computer and bypassing the network is a bit dangerous: what if the version the user downloaded accidentally had an error? There are a couple of built-in browser protections against this. For example, the Service Worker will never intercept itself! Meaning that the file sw.js that we pass to serviceWorker.register('sw.js') will never be intercepted by a fetch event. However, this does not apply to the Service Worker registration script sw-register.js, so we need to make sure that we never cache that. The standard browser cache mechanism based on the Cache-Control header is very easy to misuse, due to the confusing nature of its configuration options. To avoid those issues, its recommended to get familiar with some common Caching Best Practices, as this will help with any application in general, not only with PWAs. Errors made in setting up Cache-Control headers for our application will be troublesome in production even if we don't run a PWA, but the use of a Service Worker will make those problems much worse. We might run into a situation where we have cached the Service Worker sw.js file in the standard browser cache, because it was served with a Cache-Control header that gives the file a long lifetime. The browser will indeed cache the header, but because the file is a Service Worker it will cache it only for a maximum time of 24h instead of 1 month! This is a great precaution, but still, the website would be broken for a full day before a patch can be installed. The simplest and safest solution is to never cache the Service worker file or its registration script. 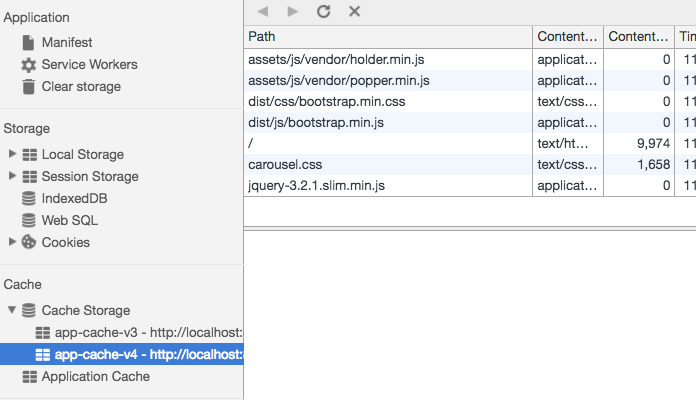 And speaking of the normal browser cache, what about the caching headers for the CSS and JS bundles? The CSS / Js bundles stored in Cache Storage will be loaded from the network, and those bundles could or could not be served with a Cache-Control header, meaning that potentially we have two caches in action, that might interfere with each other. This could lead to trouble scenarios, like for example a new version of the Service Worker gets installed, but tries to load a new version of a JS bundle file, which did not change the file name! But the file is cached in the normal browser cache, and the ancient version accidentally still gets served to the Service Worker. This means that the installation of the Service worker completes successfully, but Cache Storage now has the wrong version of one of the bundles, meaning that the application installation is corrupted. So how do we avoid running into these scenarios? The simplest is to apply the same caching policies that we would for a non-PWA application: different types of files need different caching strategies. 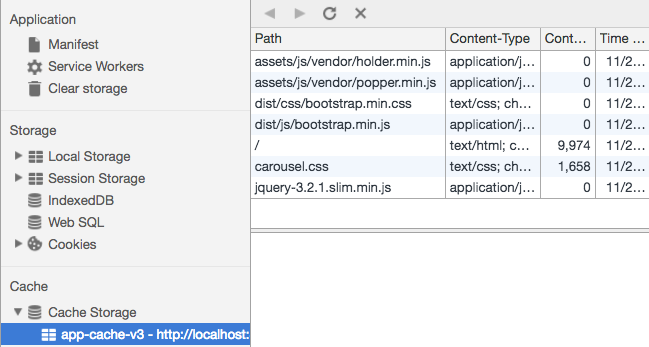 For CSS and JS bundles, the simplest is to append to the file name a hash of the file content, or a version number, like for example: bootstrap.v4.min.css. If a new version of the file is available, the file name will change (this could be enforced by the build system) and the new version will be downloaded and cached. This will avoid many common caching issues for both browsers that support Service Workers, and those who don't. In this example, we have downloaded bundles all from our local domain. But what if we would like to load CSS and JS bundles from other third-party domains from inside the Service worker, like for example from a CDN? This is possible, but the third-party domain as to allow for that cross-origin request to be executed, just like any other CORS request. As we can see, all the multiple PWA features and the related PWA APIs make the most sense if we look at them together and in the context of a specific use case, instead of in isolation. We can do much more than the download and installation use case that we covered, this was just an example that happens to be the best starting point to understand why the Service Worker Lifecycle was designed the way it was. The core philosophy of the Service Worker spec is about putting these network proxying capabilities in the hands of developers, so that we can implement many different PWA use cases and patterns, as opposed to providing only a set of predefined offline patterns (like it was the case of Application Cache). I hope that this post helps with getting started with Service Workers and that you enjoyed it!